KEE Entrance Exam 2019 Syllabus: Karunya University will schedule the entrance exam for engineering courses in the month of April. The university conducts KEE Exam at university-level only in online mode every year. KEE Exam Syllabus will be decided by the university official authority. Candidates who are desirous to take admission in the University for various Programme in the field of engineering & technology can fill the application form and submit it before the last date. Candidates need to know the exam syllabus to qualify the entrance exam and to get admission in course of their choice in the Karunya University. Here you can check the complete information related to KEEE exam syllabus, exam pattern, question papers etc. 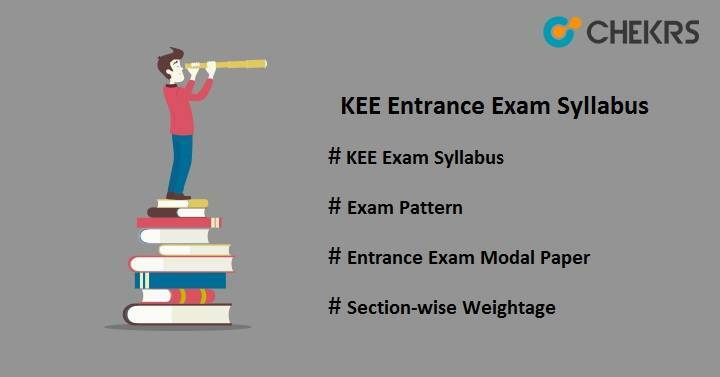 To get familiar with KEE entrance exam, it is compulsory to know the KEE Exam Pattern. The exam pattern of KEE entrance exam will help you to know the pattern of question paper, mode of examination, no of questions, marking scheme, time duration etc. Candidates should check out the previous year paper to get an overview of the paper asked in the examination. It helps the students to know about what to study & how to prepare to qualify for the exam. Marking Scheme 1 marks for each correct answer. Negative marking for each wrong response will be 0.25 marks. The Karunya University entrance exam question paper will contain the total of 120 questions from the subjects namely Physics, Chemistry, Mathematics/ Biology & General Aptitude. To qualify the entrance exam with maximum scoring marks must check the KEE Previous Year Question Paper. The Karunya University official authority will upload the KEE question paper with the solution on its official website after conducting the entrance exam. Candidates should practice KEE Sample Paper to learn how to manage the time, to know the difficulty level of paper and section-wise weightage.